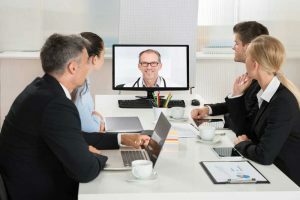 Video conferencing is increasingly being adopted by businesses across the world to connect with their teams, clients, customers, etc. who are in different locations across different time zones. The advent of technology has made it all the more easier, accessible, and reliable for companies to opt for video conferencing, saving cost and time. However, video conferencing should be regarded in the same space and accorded the same significance, urgency and preparation that go for a face-to-face meeting with clients, employees, and other teams. There are many crucial factors which if not given consideration and taken into account may mar the experience of video conferencing and leave other people on the video call frustrated and distracted. It is imperative for companies to train their employees about the courtesies and etiquettes of video conferencing in order to make every session a useful, productive and pleasant experience. In long distance video conferencing, conditions at one end may have a major effect on the experience on the other end. A good and thorough preparation is very important before any meeting. Same applies for a video conferencing session. One should prepare very thoughtfully in order to make the video meeting smooth and professional. • Share the meeting agenda and other required documents with all the participants well in advance, probably a day before. • Ensure that the web links are shared in advance so that participants are able to access those during the meeting when necessary. • Documents to be shared should not be text heavy, and should have fewer lines, preferably in bullet points wherever possible. The font style should be simple and straight, and size should be above 20 points or higher for better visibility and readability. • Power point presentations should be prepared in large simple fonts with minimal text, not more than 5 lines per slide. • Meeting room should be well-lit, in combination of natural light and over head fluorescent lighting. The walls should not be too dark. There should not be visual distractions in the room like distracting posters, banners, etc. in the background. • The room should be free of any clutter like piles of boxes in the background. The table should be free from unwanted stationery, eatables, cutlery, dishes, mobile phones, sunglasses, old coffee mugs, etc. • Check that all the files, power point presentations, audio video integration files are functional at all systems and that everyone can see and hear those. • Check the conference room about 45 minutes prior to the meeting to ensure that seating arrangement is proper, lighting is adequate, and camera angle is properly aligned and focused to cover all the participants in frame. • Do a check on all the video and audio systems including microphones, speakers, cameras, and ensure that everyone is familiar with the features and system installed. Check the mute option for every participant. • Always wear light coloured clothes in pastel and muted hues. Solid dark colours are a distraction on screen at the other end. Avoid large, dense patterns which may cause distraction and may not be easy on eye at the other end. Avoid plaids, stripes, polka dots, etc. and shiny jewellery or accessories which may cause glare in video. • Reduce environmental noise. Turn off fans, shut the doors and windows, set mobile phones and other beeps/signals on silent, lower the ringtone volume of office phones nearby, lower the alert sounds on computer and instant messaging services. • Ensure that there are name labels for every person or team when connecting to multi-point teams. • If there is an operator or service person allocated, ensure that the person is available in advance and is completely familiar with the equipment and camera. Following are the points which should be taken care of during the video conference. Team members attending the video conference for the first time should be trained and briefed about the mannerism and courtesies during an on-going call. • Every participant should speak in a normal tone of voice as if one is talking to another person in the same room. Video conferencing solutions has advanced a great deal, and the microphones embedded with the system are powerful enough to pick up sound from distances across the conference room. Unnecessary loud or modulated voice may sound very jarring on the other end. • One should introduce oneself before starting the conversation and let the people on the other end introduce themselves. This will also check the sound and video consistency before conference starts off. • Maintain eye contact with the team on the screen as if you are speaking to them face-to-face. Always look in the camera instead of the screen while talking. • One should not fidget, or make distracting movements like swaying, rocking, or pacing. Your body movements should be natural and fluidic. • One should strictly avoid checking mails, reading articles, checking Facebook, or such activities while in a video conference. This makes one appear as inattentive, distracted and not focused, which is not very encouraging for the people on the other end. One should remain as attentive and professional as one would be in a face-to-face meeting. • Always mute your microphone when not speaking. The microphones of video conferencing systems are powerful instruments which may pick sounds of a plastic wrapper, a crushed paper, tapping of finger or pen, etc. • Video and audio signals usually have some delay or latency in broadcast. So always speak in a bit slower and clearer manner, letting the audio to reach in time. Always take breaks in between while talking allowing the people at the other end to receive the signals properly. • In the end, allow enough time to all the participants to summarize, review the points discussed and decisions taken. There should be enough closure space.